What do you get when you have a Cop, Real Estate Agent, 2 Teachers, Youth Pastor and an Archivist, then add a Prison Manager? Any ideas? You get a Prince, an artist, a surgeon or more precise the Queen’s Surgeon and a Sir to boot, two prostitutes and a sweet shop girl, and then add the Director. You also get a variety of personalities, passion, fire in your belly, vision, dedicated hard work, sometimes tears, often laughs but most of all a strong bond with one clear vision – to rehearse and deliver an outstanding performance to their audience. And with the Director and the cast, is a team of people behind the scenes whom are often not seen, the production team. The play is Yours Truly, Director Graham Dack and Producers Amdram Theatre, written by New Zealander Albert Belz. 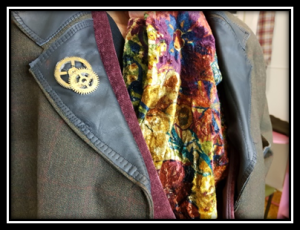 The play is steampunk inspired as it is set in 1888 during Jack the Ripper’s ‘Autumn of Terror’. The Victorian period was steeped in velvet, brocade, silk, cuffs, collars, big skirts, lace and add steampunk into the mix you have a great combination. Eddie – Prince Albert Edward Victor, Duke of Clarence and Avondale, mid 20’s and Queen Victoria’s grandson. He is a bit of a Dandy loving his collars and cuffs. (Eddie is played by Ben Broughton). His character lent itself to the use of a bit of more luxurious fabrics teamed with black. Basic black trousers and shoes from Wardrobe, custom made double breasted waistcoat with fob watch, lace pocket handkerchief, white dress shirt with lace cuffs, separate collar, silk cravat and Scottish broach, black woolen (bowling jacket) extended with brocade. 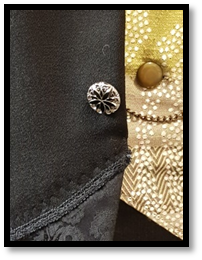 The waistcoat was designed and made for him with a combination of black satin for the backing, rich burgundy velvet lapels and silk and poly cotton mix front (curtain fabrics). 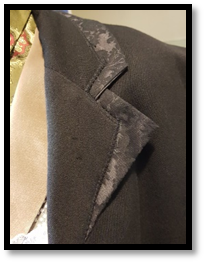 The woolen jacket was reshaped by reshaping the bottom and adding black brocade, and changing the shape of lapel to make the buttoning higher and more in keeping with the period, brocade trim under the lapel and collar and pleated cuffs were added in brocade. Vintage black glass buttons finished the look. A black velvet top hat trimmed with green silk and pheasant feather and a walking cane. He has a change in cravat during the show. The broach represented the Scottish connection and pheasant the Royals love of hunting. A real toff you might say! 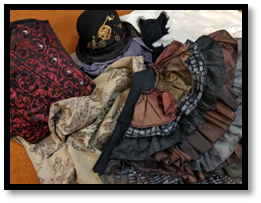 Her character needed to be fresh, light and happy, in love… she has three costume changes within the play but certain fabrics and parts of costumes are used in each change. Her sweet shop costume is a basic blouse which had the collar, upstand and cuffs removed. 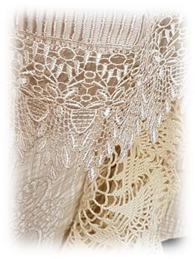 Cotton lace was added down the front, neck, cuffs and center back, a simple design. 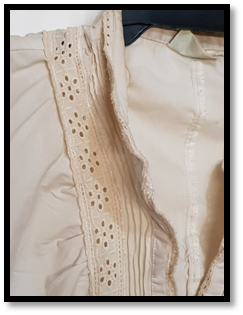 Her blouse was then tea dyed briefly to take the white out of the fabric so the light didn’t grab it. Her skirt was a simple design (no pattern) that I have made for many of my steampunk skirts. 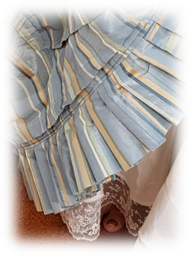 It was finished in a pleat at the bottom (Andrea was the lucky person to make the pleats) and a couple of big tucks to help lift the skirt. Her blouse is worn through the whole play. Dianne made spats to cover her black boots to help keep the outfit light. Change of scene, the skirt is changed and a lace collar, bustle and hat added. 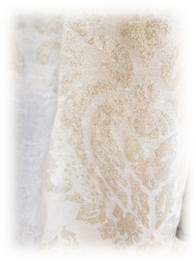 The skirt is also another of my designs with a soft oatmeal background colour and a soft gold pattern that reflects in some lights. 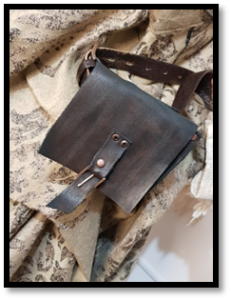 The bustle is an original design from a jacket bustle I designed for Thames. 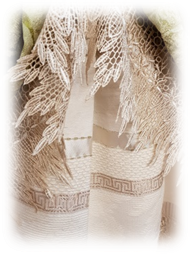 It consists of three layers of curtain fabric, a large contemporary design on the base, a horizontal strip in different textures then the same silk that was used in Eddies, waistcoat and hat. 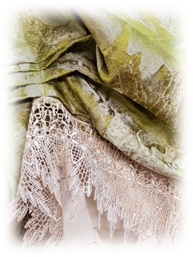 Layers of lace added to give the bustle a lift and make it more luxurious. 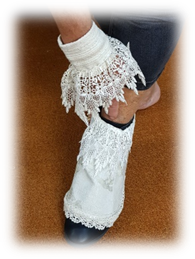 Annie also wears lace cuffs in the first part of the play. 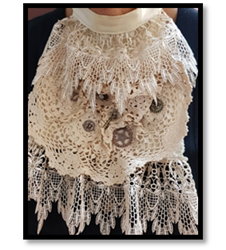 Dianne made both of these garments. The last costume change Annie is stripped down to her (Second skirt) blouse and wears a smock in keeping with the evolving character. 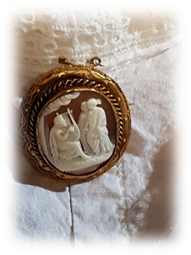 She also wears her grandmother’s brooch in one of the scenes. A nice touch! Sickert – Walter Richard Sickert of German decent a social climber, Prince’s ‘lapdog’. He is an artist who like to sketch and paint nudes. Much of his work can be seen on the net. He has been cast in bohemian style which suits his personality and profession. (Sickert is played by Julian Annear). 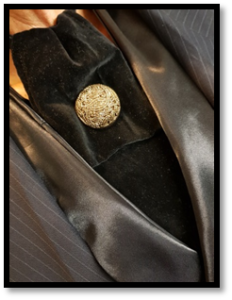 His character was fun to dress – woolen jacket from Wardrobe, the lapel reshaped and black leather was overlaid on the lapel, collar, pocket flaps, cuffs and back panels and cogs glued to one lapel. 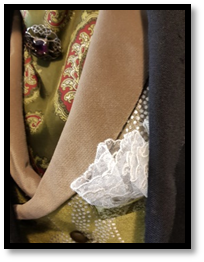 I originally had him in a deep burgundy shirt (from Wardrobe) but he looked like a blob with no definition under the lights so I made a terracotta coloured drop shouldered shirt with a leaf pattern, a paisley single breasted waistcoat in deep green and burgundy with a burgundy satin back and burgundy lapel. 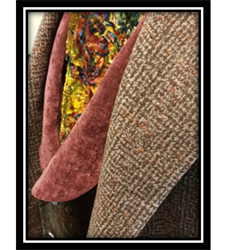 His neck tie is a combination of the shirt fabric and a ‘painters palette’ upholstery velvet. 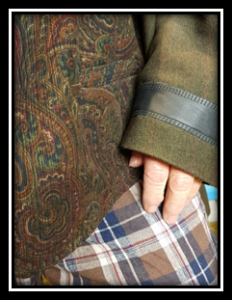 This ensemble was finished with plaid trousers dyed in tea to dull the white. Trousers had been in issue because the ones that fitted him looked too much like a modern day suite. I found the fabric in a fabric treasure-trove in Wellington. He also wears a woollen vintage overcoat in two of his scenes. And in his latter scenes a red silk scarf which plays a significant part in the play. A colourful character! Mary Kelly – Whitechapel Prostitute is a feisty women, attractive and in her mid 20’s. She poses for Sickert and lives with Joe on and off. Her lover is Harvey also a prostitute. (Mary K is played by Sarah Riley and Harvey is played by Talia Annear). Mary Kelly and Harvey are costumed similar with subtle differences. Mary Kelly is a lead actor with Harvey supporting. I costumed them in the same skirt fabric, with one skirt being reversed so appears slightly darker. I designed their bustles the same shape with the same layers of fabric but in different orders. 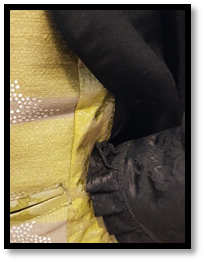 Mary Kelly is more slight build so the fabrics were a little lighter in weight and Harvey’s fabrics heavier at the bottom. Mary Kelly wears a purple and black corset whereas Harvey’s is red and black. 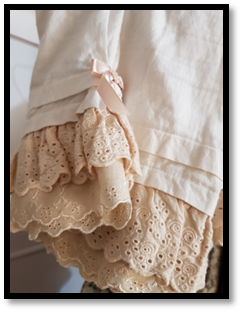 Each wears bloomers finished with cotton lace and a lace trimmed blouse. These costumes took the longest to make. The bloomers and basic shirts came from wardrobe. Each started out like a white plain school shirt. 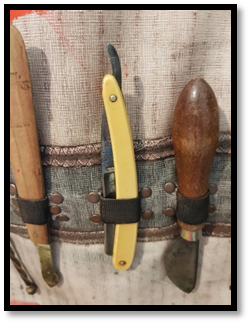 The collars, upstands were removed and the sleeve removed to make them a short, short sleeve. 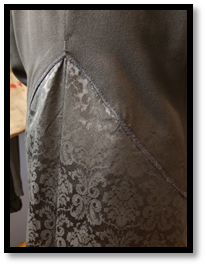 Cotton lace was added in parts, pin tucking done to help bring them in. They needed to be very fitting and subtly reveling and the final process tea dying them to give them an aged look. Bloomers were patched, lace and ribbon added and also dyed. 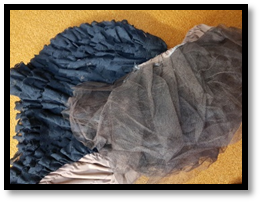 Petticoats had lace added and Harvey’s dyed black. The dye didn’t hold so was re-dyed, still not holding has ended up being an unusual grey grape colour. 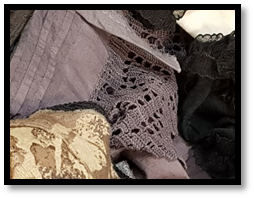 Mary Kelly’s petticoat is trimmed in black lace and dyed in tea as I was not wanting to go through the black dye saga. Both skirts are held up by internal ties so they flash their underwear and a bit of leg above their stocking tops. Black fingerless gloves were made and black neck embellishments. 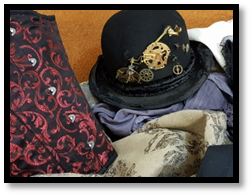 Both girls wear vintage bowlers decorated with cogs from a mantel clock. They also share a tasseled shawl. 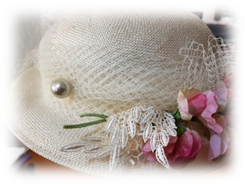 One scene Mary Kelly wears a black straw hat decorated by Diane and a lace collar also Dianne’s creation. 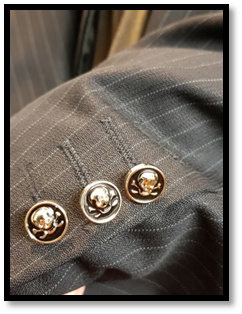 The fabric in all three girls skirts is the same design. Gull – Sir William Withey Gull. The Queen’s surgeon is played by Chris McKenzie. Chris has a powerful role with huge dialogue. 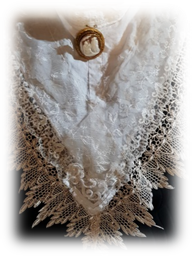 He is dressed in a white shirt from Wardrobe, a flocked custom designed waistcoat with satin lapel, tailored woolen trousers, a black velvet cravat and tailcoat. He also wears a black cloak and a top hat. His working attire is a surgical apron. 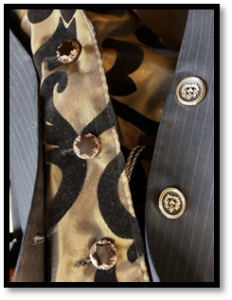 The suit was in Wardrobe and was an easy fix from suit to a tailcoat. The legs are cut off about crotch level then re-stitched to the jacket. His brass buttons on the sleeves are small skulls and crossbones. Gull was also challenging because of his quick complete changes and the short time between scenes. When Gull died no long after the Ripper murders, he was the richest man in England. I have thoroughly enjoyed being involved in this aspect of theatre again. It has been challenging at times, experimental and given me a chance to use some old techniques I haven’t used in a long time. I’ve also had a great team to work with.